Among the most renowned animators in Disney’s history, Ward Kimball is one of the original ‘Nine Old Men’ who brought the magic of Disney animation to the heights of achievement during the 1940’s and 1950’s. 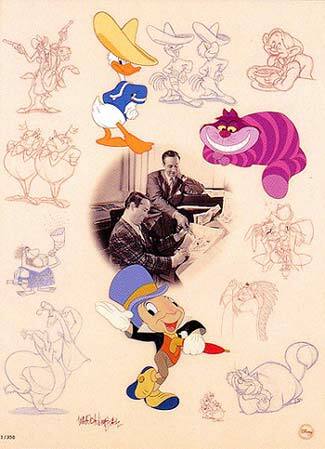 Kimball joined the Disney team in 1934 as an animator and was fundamental in the animation of comic, eccentric – even bizarre – scenes. His abstract comedic visual sensibility is particularly displayed in the title number of ‘The Three Caballeros’, and his sense of the absurd is on full exhibition in the Mad Tea party sequence of ‘Alice In Wonderland’. He may be most recognized for his animation of Jiminy Cricket in ‘Pinocchio’. Kimball was also principally responsible for Donald Duck in ‘The Three Caballeros’, 1944, Pecos Bill in ‘Melody Time’, 1949, Lucifer the cat in ‘Cinderella’, 1950, and the Chesire Cat, The March Hare and The Mad Hatter in ‘Alice In Wonderland’, 1951. This hand-inked and Hand Painted Limited Edition Cel captures many of Kimball’s great animation moments. The fine art lithographic background recreates several of Kimball’s own drawings and a 1940’s photo of Kimball working with Walt Disney. Ward Kimball has personally signed each work of art in the edition.